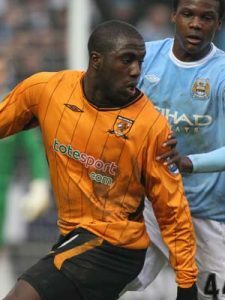 USA international Altidore spent 2009/10 on loan at Hull City, the tricky second album of the Tigers’ Premier League career. Jozy was just 19 years old when he came to City but he had already been snapped up by Spanish side Villareal after a successful season in front of goal for New York Red Bulls. The young man clearly had footballing talent to match his impressive physique, but the enormity of trying to prop up a side careering out of the League was too much for young Jozy, who only contributed one League goal and ended his time at the KC with a silly red card after flegging at Sunderland dunderhead Alan Hutton. Born to Haitian parents in New Jersey and raised in Florida, Altidore’s prodigous talent saw him snap up early in the draft system at the age of 17 by New York Red Bulls. At the age of 18 he switched to Villareal but in three seasons he played only a handful of games for Spaniards and switched to AZ Alkmaar in 2011. In two seasons Altidore found his professional feet, banging in 40 goals in 70 starts. That form encouraged Sunderland to part with around £10 million in July 2013, in return for Altidore’s service. Alas his difficulties in front of Premier League goals first experienced at Hull reared its head again, and in a season and a half he managed only one league goal. In January 2015 he switched to Toronto FC, with Jermain Defoe going in the other direction, and the goals have again flowed amongst the Canadian hipsters. Altidore was identified early by the USA national team and he played at under-17, under-20 and under-23 levels. he made his senior debut for USA in 2007, the day after his 18th birthday. Since then he has been the States’ regular striker and earned his 100th senior cap in January 2017. He dates highly ranked USA tennis star Sloane Stephens, who is internationally recognised in her own sport.